When European settlers landed on the shores of the Atlantic Coast, they found a widely varied landscape. While many believe that the entire northeastern United States was covered in mature forest, historical evidence suggests otherwise. Early explorers wrote about vast prairie-like expanses of grassland and open woodlands of park-like quality, and described many early-successional plants, shrubs and trees. They also spoke frequently of a land brimming with wildlife species often associated with early-successional landscapes (grasslands, open woodlands, shrub-scrub habitats). Native Americans used fire as a tool to make hunting and traveling easier. Naturally occurring wildfire and fires set by the Indians helped shape the pre-European landscape of North America, which included a mosaic of early-successional habitats. The practice of burning forests and grasslands was, and still is, a universal practice among aboriginal people around the world. There is evidence of human habitation in southern New Jersey over the last 10,000 years. That evidence, coupled with the writings of many notable early explorers, suggests that grasslands, shrub-scrub areas, and open woodlands - or savanna-like landscapes - may have been quite common in this area prior to the 1600s. As Europeans settled here, land-use changes occurred. By the early 1800s, much of the forests of the east had been cut down and early-successional habitats were widespread. As agricultural practices began to change again throughout the 20th Century, early-successional areas were lost as farm fields reverted to forests or subdivisions and shopping malls. Today, only 5% of New Jersey's landscape remains in early-successional stages of development and many of our grassland or early-successional species of wildlife are on the decline. This dilemma is common across the United States. Many of these species, particularly birds, are listed as federally endangered or threatened, or on national watch lists. At Buckshutem Wildlife Management Area (WMA), located in the center of Cumberland County, the Division of Fish and Wildlife has a unique opportunity to restore approximately 128 acres to a complementary mix of early-successional habitats. Buckshutem was chosen as the site of this project because several species of grassland birds and disturbance-dependent wildlife occur - or have traditionally occurred. There are still pockets of northern bobwhite quail found in the area. In addition, grasshopper sparrows, a threatened grassland species, and the threatened red-headed woodpecker, an open-woodland species, are known to occur in Cumberland County. 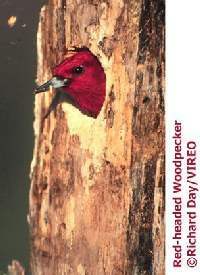 Red-headed woodpeckers are a species of particular concern for the Division. Habitats used by these medium-sized woodpeckers are characterized by scattered mature trees with an open herbaceous understory as well as forested edges with nearby open areas, or burned areas. Red-headed woodpeckers catch insects on the wing and stoop to catch prey on the ground. They feed heavily on insects found in dead wood, wild and cultivated fruit, and various seeds and nuts. Their winter diet is almost entirely acorns and beechnuts. As cavity nesters, they require fairly large, dead wood to provide suitable nest sites. These woodpeckers thrive in savannas, or park-like woodland ecosystems. Northern bobwhites are declining throughout the U.S. mostly because of habitat loss due to changing land-use practices. They are designated, along with other grassland birds, to be a priority species for the USDA's Wildlife Habitat Incentive Program in Southern New Jersey. Bobwhites require large open grassy areas that can provide permanent, usable cover. Quail spend most of their time on the ground. They need to be able to run along the ground while remaining under cover. They also depend on the seeds of herbaceous annuals for their major food source. Warm season grasses (often referred to as bunch grass) are preferred. These grasses grow in clumps allowing room in-between for quail to maneuver. Warm-season grasses produce massive quantities of seed in the fall, and because of their growing pattern, provide thick, overhead cover that affords protection from both predators and the elements. Warm season grasses are the native grasses of North America. The American kestrel, eastern meadowlark, summer tanager, savanna sparrow, blue-winged warbler, yellow-bellied sapsucker and whip-poor-will are considered early-successional species and most are in decline. The savanna-grassland ecosystem that will be restored here will provide prime habitat for these birds and more. Other species that will benefit from this type of habitat management include several species of Lepidoptera (butterflies and moths). The Edward's hairstreak, frosted elfin butterfly, northern cloudy-wing, and the swarthy skipper are grassland-associated species whose larvae feed on grasses and legumes. Look for eastern cottontails to benefit from this restoration as well. The Buckshutem WMA is comprised of woodlands and agricultural fields. The woodland is a mix of maturing pine and oak species with a few hardwood wetland drainages. This land has had a long history of timber harvest, clearing and agricultural uses over the past few centuries. Wildfire has not played a major role in the development of the existing woodland. The soils, topography, and vegetation present at Buckshutem provide necessary factors for managing and maintaining early-successional landscapes. Areas of woodland designated as savannas will be targeted to open the canopy enough to allow for 60% of the ground to receive direct sunlight in patches. Herbaceous plants, including warm season grasses, volunteer when light is adequate. Oaks will be the predominant trees because they provide important food for wildlife. A mix of pines, hickories and other hardwoods will be left, also to provide a variety of fruits and seeds. All snags and dead wood will be left to provide important nesting and feeding sites. Approximately 105 acres of savanna will be created at this site. In addition, approximately 8 acres of new grassland fields will be created adjacent to the savanna and 15 acres of soft edge will be created adjacent to the existing agricultural fields. Early-successional habitats appear to have played an important role in the landscapes of southern New Jersey for centuries. It appears that the decline in these important habitats has played a major role in the decline of wildlife species dependent upon early-successional stages of landscape development. The Division of Fish and Wildlife feels that state lands dedicated to natural resource protection and management can play an important role in providing for the habitat needs of wildlife on a regional basis. The Division has worked closely with a number of nationally recognized conservation organizations to develop the restoration plan at Buckshutem. The New Jersey Conservation Foundation, The Nature Conservancy and recognized experts in wildlife ecology from Rutgers University assisted with the development of this plan with guidance from the New Jersey Endangered and Non-game Species Advisory Committee. In addition, the Southern New Jersey Chapter of Quail Unlimited, Land Dimensions Engineering, the USDA's National Resource Conservation Service, and the South Jersey Resource Conservation and Development Council, Inc. provided input and funding for this project. This plan utilizes some of the best available technology, employing cutting-edge management techniques to create grasslands and restore savannas. This restoration project is being viewed by other northeastern states as a potential model. The restoration of early-successional habitats at Buckshutem will be monitored closely to determine how effective this type of management can be for these species. Adaptive management will be used in the restoration and maintainance of these habitats, allowing the division to respond quickly to monitoring results. This type of management can, with proper planning, be applied on a landscape level to many public and private landholdings around New Jersey. The ultimate result will be the restoration of much of our rapidly disappearing wildlife legacy.